IN THE FOOD CHAIN PART OF THE WEB OF LIFE, there are predators (like lions), who actually hunt prey, and “kleptoparasites” (like hyenas), whose specialty is stealing the prey out from under the predator who just killed it. Marine biologists studying the tiny, colorful nudibranch Cratena peregina have added a new concept to both science and the language: “kleptopredation,” or consuming not just something else’s prey, but that “Something” itself. It’s long been known that C. peregina made its living by feeding on the polyps of plankton-feeding hydroids – but the assumption was that that was the end of the story. 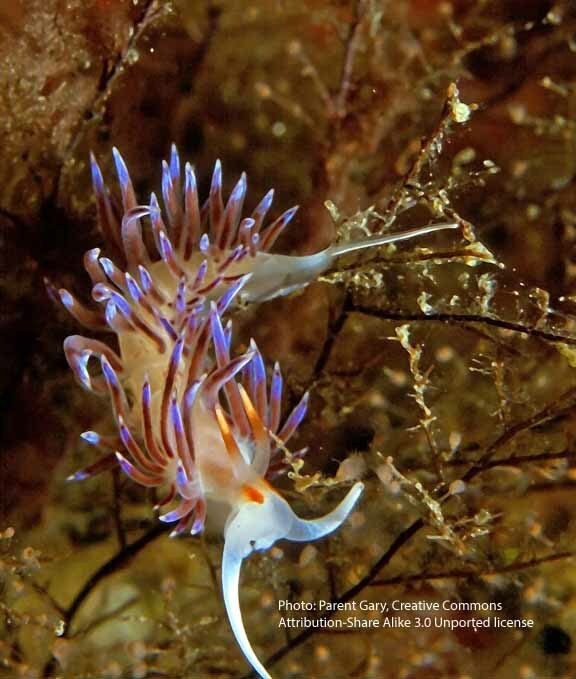 In their research, the team of British and Italian scientists found that the little sea slugs not only devoured the polyps of Eudendrium racemosum hydroids but that they focused on hydroids that had just ingested their fill of planktonic prey, thus increasing the nudibranchs’ nutritional reward. An Eudendrium racemosum hydroid, prey to another nudibranch species. Their article, Kleptopredation: a mechanism to facilitate planktivory in a benthic mollusk, was published in the November 1 issue of the journal Biology Letters. C. peregina, is one to two inches long, has the typical wild nudibranch coloration and a spectacular set of flashy exterior ridges called cerata. It’s found in the Mediterranean and eastern Atlantic, from the English Channel to Senegal on the west coast of Africa. They provided several dozen C. peregina with the choice of prospective colonies of hydroids sated with plankton (in the form of tiny brine shrimps), other colonies that had not eaten and free-swimming brine shrimps themselves. 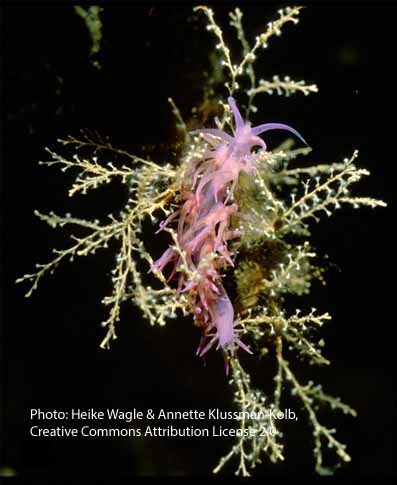 More than half of the nudibranchs went directly to the colony of fed hydroids and ate about twice as many fed polyps as unfed ones. They estimated that the plankton the nudibranchs consumed accounted for about half their diet. They also surmise that this behavior may be widespread among other invertebrates, a possibility that may alter the understanding of the food web. You can read the study in Biology Letters by clicking on the article above. For more reader-friendly accounts, go to “‘Kleptopredator’ Found: Sea Slug Attacks After Prey Has Eaten” in Live Science or “When this Sea Slug Eats, it Prefers the Turducken of the Sea“ in the New York Times.